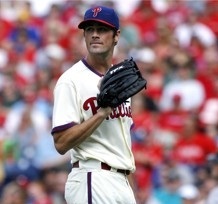 PBR - If today was in fact Cole Hamels' last start in Philadelphia he'll be leaving on a sour note. The Giants knocked him around for 10 hits and five runs through 7 2/3 innings en route to a 6-5 win over the Phillies on Saturday afternoon at Citizens Bank Park. Hamels tossed a career high 128 pitches in the losing effort. Aware it may have been his final start as a Phillie, Hamels walked off the field to a standing ovation and acknowledged the crowd with a wave. Reports continue to circulate that Hamels and Phillies are moving in the right direction regarding a possible agreement to keep the 28-year-old in Philadelphia, but nothing is formalized or guaranteed. "I think that's just kind of up in the air with [general manager Ruben Amaro Jr.] and my agent [John Boggs] and just trying to work things out," Hamels said. Of the 10 hits Hamels allowed Saturday, three were homers. He also walked three. Trailing 5-4 in the eighth, Melky Cabrera tied the contest with a solo-shot off Hamels. Jonathan Papelbon tossed a scoreless ninth but imploded in the 10th, walking Cabrera and surrendering a bloop single to Buster Posey that allowed Cabrera to go from first to third. Gregor Blanco hit a drag bunt single down the first-base line later in the frame to score Cabrera and ultimately clinch the victory. The Giants jumped to a 3-1 lead in the third with a solo homer by pitcher Matt Cain and a two-run blast by Posey. Hamels answered in the bottom of the frame with a solo shot of his own, the first of his career, to draw the Phillies to within two. It was the first time pitchers homered off each other in the same game since Atlanta’s Kevin Millwood and Colorado’s Denny Stark did it on May 18, 2002. The last time it happened in the same inning was May 14, 1990 when Montreal’s Kevin Gross and Los Angeles’ Fernando Valenzuela went deep in the third inning. Trailing 4-1 in the sixth, Ryan Howard clubbed a three-run blast to right center to tie the contest. Cain tossed eight innings, surrendering five runs on five hits, including three home runs. Sergio Romo retired the two batters he faced in the ninth and Santiago Casilla finished for his 24th save. The two clubs will complete their three-game set on Sunday with Joe Blanton scheduled to oppose Barry Zito.